Issued in 1910 by the American Caramel Co. based out of Philadelphia, the set that has become known as E91-C features the stars of the Pittsburgh, Washington, and Boston franchises. 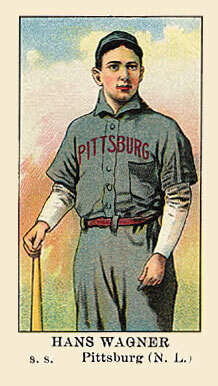 Among those included on the checklist is arguably the greatest star of the era: Honus Wagner. Issued just one year after his T206 card – now the most valuable sports card ever produced – the E91-C Wagner can be had for an infinitesimal fraction of the price. Why? Not because it is available in mass qualities – SGC has only encapsulated 36 examples, while competitor PSA has slabbed just 29 – and just one is currently available for purchase on eBay. No, the reason the card remains affordable is one of artistic reasons – the image on the card is a generic player image with Wagner’s name affixed, rather than a lithograph of an actual Wagner photo. It could have just as easily been teammate Fred Clarke. Over a span of three years (1908-’10) and three series (A, B, and C) the E91 set boasts an impressive checklist with an unimpressive prices. The set is a veritable who’s who of deadball era Hall of Famers including Chief Bender, Roger Bresnahan, Mordecai Brown, Frank Chance, Eddie Collins, Johnny Evers, Christy Mathewson, Joe McGinnity, John McGraw, Eddie Plank, Joe Tinker, and Rube Waddell in the loaded series A; Home Run Baker and Rube Marquard were added for series B; and series C included the aforementioned Clarke and Wagner joined by Harry Hooper, Walter Johnson, Tris Speaker, and Vic Willis. If you would like to collect three of the greatest teams of the era – the Giants, the Cubs, and the Athletics – along with a wide checklist of Hall of Fame players then E91 might just be a set worth considering. That is, of course, if you do not mind the generic player artwork. See a sampling of cards for sale here . In similar vein is the much maligned and often under-appreciated set issued by Mecca Cigarettes in 1911, that is now referred to as T201 or ‘double folders’. Like E91, T201 features generic artwork with an impressive lineup of the game’s great stars. Unfortunately, the cards are somewhat larger than traditional cards of the era – and even today. Their cumbersome nature too has played a role in their affordability. Despite being considered the best player of the decade – if not the era – Ty Cobb is forced to take the back seat to HOF teammate ‘Wahoo’ Sam Crawford. Among the Hall of Famers included on the checklist are Chief Bender, Zach Wheat, Christy Mathewson, Mordecai Brown, Fred Clarke, Nap Lajoie, Tris Speaker, Hughie Jennings, Walter Johnson, Joe McGinnity, and Ed Walsh. Perhaps most impressively, several of the cards issued feature a combination of Hall of Fame teammates of the era. 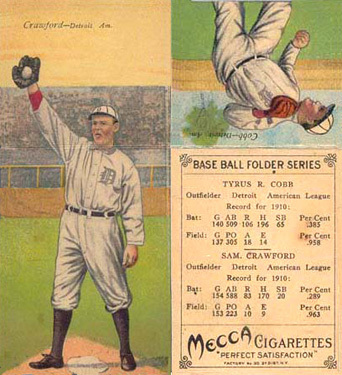 These cards include the pairing of Home Run Baker and Eddie Collins from the famed $100,000 infield, Roger Bresnahan and Miller Huggins, Frank Chance and Johnny Evers forever immortalized by Franklin P. Adams’ “Baseball’s Sad Lexicon“, and Sam Crawford paired with Ty Cobb (click here to see them on eBay. For those looking for more realistic artwork without having to smash the piggy bank you just began saving on New Year’s, collector’s might consider the 1912 American Tobacco Co. brown background set, known as T207. 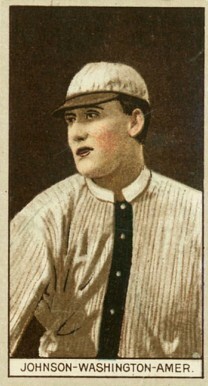 While featuring the likes of Chief Bender, Roger Bresnahan, Max Carey, Frank Chance, Harry Hooper, Rube Marquard, John McGraw, Tris Speaker, Joe Tinker, Bobby Wallace, and Zach Wheat, the set omits heavyweights like Mathewson, Cobb, and Wagner making it unpopular with set collectors and resulting in making it more affordable. The set does however include Walter Johnson, who was on his way to what many baseball historians consider to be the best pitching career in the history of the game. There is also the inclusion of little-known, unheralded Louis Lowdermilk, who has gone on to become the most valuable card in the set. Perceived as being scarce by early pioneers, the Lowdermilk was once considered one of the rarest cards of the era. While many have come out of the woodwork – literally in the case of the Louisiana Find – its reverence in early hobby lore continues to capture the demand of collectors. For those looking to enter into back collecting outside of the complexities of T206, the T207 set can be found with a variety of backs including Recruit, Napoleon, Broadleaf, Cycle, and Red Cross. Over 700 T207 cards were currently on eBay as of this writing.